Note that RNA Sample Purification beads are not included in this kit. If beads are required, we recommend ordering the NEBNext rRNA Depletion Kit with Sample Purification Beads (NEB #E6350). Ribosomal RNAs (rRNAs) are extremely abundant, constituting 80–90% of total RNA. Efficient removal of rRNA is critical to enable cost-effective sequencing of RNA samples, but this can be especially challenging with low quality RNA (e.g. FFPE RNA) and with low input amounts. 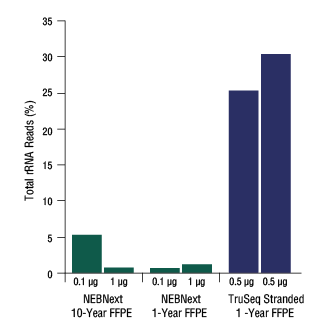 The NEBNext rRNA Depletion kit employs the efficient RNase H method, as well as complete probe tiling of rRNA, thereby ensuring that even degraded rRNA is hybridized and subsequently removed. The NEBNext rRNA Depletion Kit (Human/Mouse/Rat) employs an RNaseH-based method (1,2) to deplete both cytoplasmic (5S rRNA, 5.8S rRNA, 18S rRNA and 28S rRNA) and mitochondrial ribosomal RNA (12S rRNA and 16S rRNA) from human, mouse and rat total RNA preparations. This product is suitable for both intact and degraded RNA (e.g. FFPE RNA). 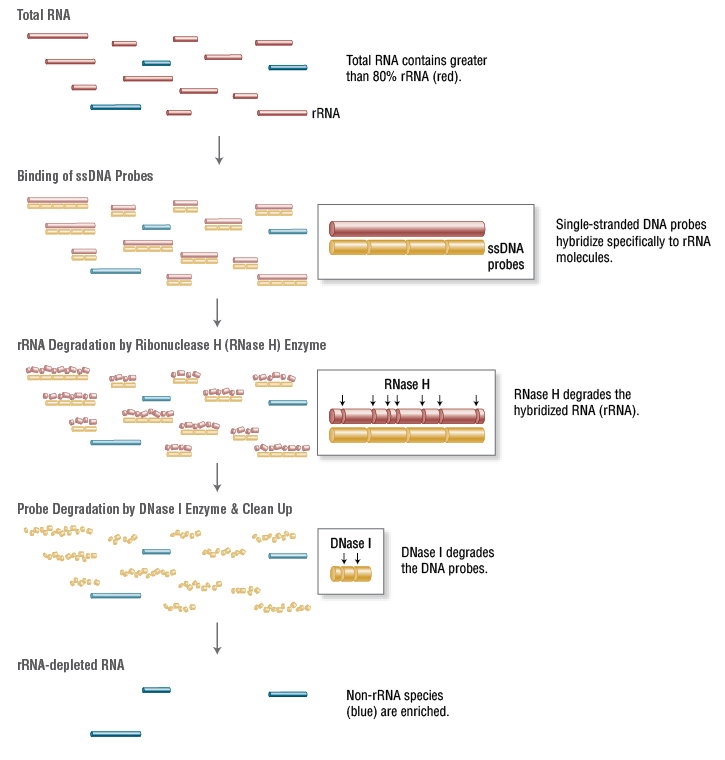 The resulting rRNA-depleted RNA is suitable for RNA-Seq, random-primed cDNA synthesis, or other downstream RNA analysis applications. Now also available with optional Agencourt® RNAClean® XP beads for RNA purification. For larger volume requirements, customized and bulk packaging is available by purchasing through the Custom Solutions department at NEB. Please contact [email protected] for further information. RNA-seq libraries were generated from Universal Human Reference Total RNA (UHR, Agilent) or Breast Cancer FFPE RNA (with an archive age of 1 year and 10 years). RNA?was either untreated or treated with the NEBNext poly(A) mRNA Magnetic Isolation Module (NEB #E7490) or the NEBNext rRNA Depletion Kit. RNA-seq libraries were made using the NEBNext Ultra Directional RNA Library Prep Kit for Illumina (NEB #E7420). Reads were mapped to the hg19 genome and read distributions were determined using Picard RNA-seq Metrics. Libraries generated from rRNA-depleted RNA result in comparable low rRNA reads to poly(A) mRNA-enriched RNA, while also retaining more noncoding reads. rRNA depletion efficiency is achieved even with FFPE RNA. Ribosomal RNA was depleted from intact Universal Human Reference Total RNA (UHR, Agilent) (RIN>9) and degraded UHR Total RNA (RIN<3) using either the NEBNext rRNA Depletion Kit, Ribo-Zero Magnetic Gold Kit (Human/Mouse/Rat) (Epicentre) or Ribo-Zero Gold provided within the TruSeq Stranded Total RNA Kit with Ribo-Zero Gold (Illumina). rRNA- depleted RNA libraries were made using either the NEBNext Ultra Directional RNA Library Prep Kit for Illumina (NEB #E7420. Green and blue bars) or the TruSeq Stranded Total RNA Kit with Ribo-Zero Gold (Illumina, red bars). Total rRNA-aligned reads were determined using Bowtie 2.0 (local, sensitive). NEBNext rRNA-depleted libraries contain a minimal percentage of rRNA reads regardless of the quality of the RNA. 0.1 μg, 0.5 μg or 1 μg of breast cancer FFPE RNA samples (with archive ages of one year and 10 years) were depleted of rRNA using either the NEBNext rRNA Depletion Kit or the TruSeq® Stranded Total RNA Kit with Ribo- Zero Gold (Illumina #RS-122-2301). 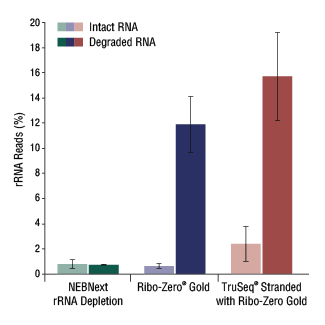 rRNA-depleted RNA libraries were made using either the NEBNext Ultra Directional RNA Library Prep Kit for Illumina (NEB #E7420)(green bars) or the TruSeq Stranded Total RNA Kit with Ribo-Zero Gold (blue bars). Total rRNA-aligned reads were determined using Bowtie 2.0 (local, sensitive). 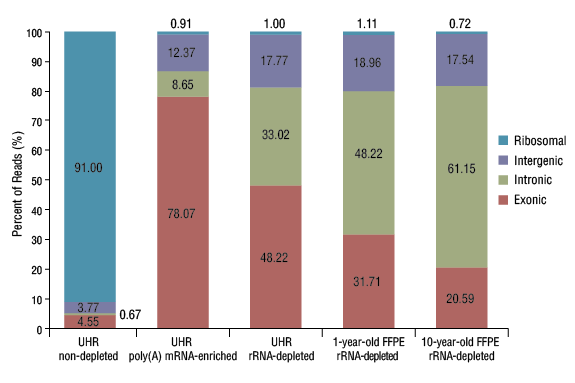 NEBNext rRNA-depleted FFPE libraries result in a minimal percentage of rRNA reads, regardless of the archive age of the FFPE RNA. 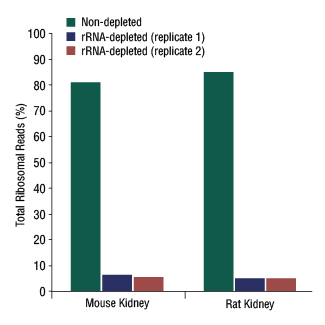 Ribosomal RNA was depleted from mouse and rat kidney total RNA (two technical replicates) using the NEBNext rRNA Depletion Kit. RNA-seq libraries were made from non-depleted Total RNA or rRNA-depleted RNA, using the NEBNext Ultra Directional RNA Library Prep Kit for Illumina (NEB #E7420). Total rRNA-aligned reads were determined using Bowtie 2.0 (local, sensitive). NEBNext rRNA-depleted mouse and rat libraries contain a minimal percentage of reads mapping to rRNA. Libraries were made from UHR RNA (Agilent) and Breast Cancer FFPE RNA (with archive age of one year and 10 years), both non-depleted and depleted rRNA using the NEBNext rRNA Depletion Kit. All libraries were made using the NEBNext Ultra Directional RNA Library Prep Kit for Illumina (NEB #E7420). TopHat2 and Cufflinks were used for read mapping and transcript assembly and quantification. FPKM (Fragments Per Kilobase of transcript per Million mapped reads) correlation analysis indicates very good transcript expression correlation (R >0.93) between Depleted and Non-Depleted libraries. NEBNext rRNA depletion does not affect transcript expression levels. Adiconis, X. et al (2013). 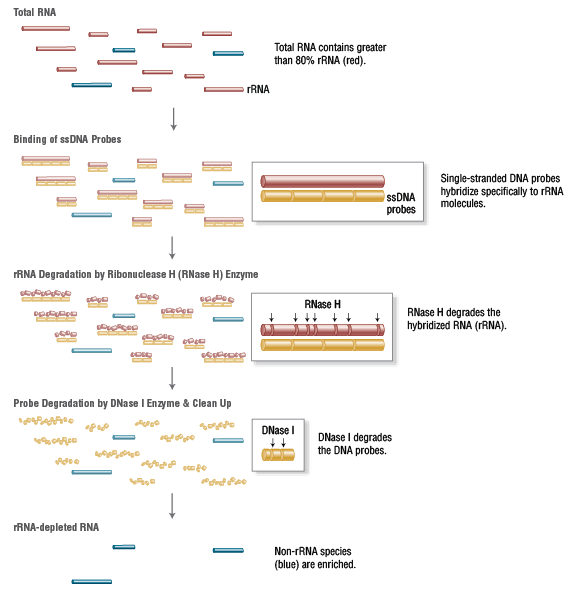 Comparative analysis of RNA sequencing methods for degraded or low-input samples. Nature Methods 10. 623-629. Morlan,J.D. et al. (2012). Selective depletion of rRNA enables whole transcriptome profiling of archival fixed tissue. PLoS One 77. e42882. What is the expected RNA yield recovered after rRNA depletion? What is the total RNA input I should use? What is the percentage of rRNA left after depletion? Can I use purification methods other than Agencourt RNAClean XP Magnetic Beads? Can I use Agencourt AMPure XP Magnetic Beads instead of RNAClean XP Magnetic Beads? Can I use this product with degraded RNA or fragmented RNA? To remove ribosomal RNA from total RNA, should I use the NEBNext Poly(A) mRNA Magnetic Isolation Module (NEB #E7490) or the NEBNext rRNA Depletion Kit (NEB #E6310)? Does the NEBNext® rRNA Depletion Kit (Human/Mouse/Rat) work for ribosomal footprinting or profiling application? This product and its use are subject to one or more issued and/or pending U.S. and foreign patent applications. Commercial use for the determination, prediction and prognosis of cancer, or response to therapy for cancer, in humans or animals may require a license. Please contact [email protected] for more information.